A Kotaku reader writes us to say that he's seen a first glimpse of Ubisoft's Assassin's Creed II, his recounting of which is somewhat different from what we'd previously heard rumored about the sequel. Reader James tells us that the focus testing he saw places the next Assassin's Creed in Venice, Italy, and that "disguises were also said to play a part in this game." The Carnival of Venice sure sounds like a good fit to us—plenty of undercover opportunities to stab portly bad guys in the neck and a visual style that's far removed from the previous game's setting. We know the game is coming, but does James' description of the rumored Assassin's Creed follow-up sound like something you'd want to play? His description follows. Venice 15th/16th century, The camera pans onto the city focusing on the hussle and bussle of daily life. think the civilians from assassins creed 1 but more interactive with each other. During this scene we see a man passing money to the hands of an attractive girl, (originally i didn't notice this but was told by the rep that it does happen). 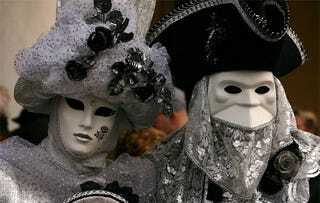 2 Men, a relatively large one and a skinny one step off a boat with a cohort of guards and proceed to a Square within the city, where a masked ball was taking place. Every ones dancing around, not much to say here other than that it was a ball. The girl seen previously accepting the bribe, approaches the skinnier of the two men and takes him off to the crowd, for a dance, she was good looking, who'd say no. The camera spins around them centrally, but focusing on the dancers as a whole. A guy comes out from the side, dressed in dancers garb and proceeds to stab this skinnier man in the neck, with what looks like the finger blade from AC1. Man dies spewing blood, garbble garbble etcetc. The 2nd of the men, the fatter one, notices this and proceeds to run, after sending the guards after the protagonist. Who, by this time has reached the roof and runs parallel to the target who continues to run on the floor. The player jumps off onto the ground and the fat man stops. commenting on the fanciness of the jump. Facing off, the fat man continues to speak. i cant quite recall the exact words but it was something along the lines of "It was a shame that your mother had to die, she was a beautiful woman ... Your father on the other hand, it was due to your arrogance that he died"
The protagonist then shoots at the fat man with a bolt pistol, and the trailer ends. Post trailer discussion, a family feud was hinted at, yet nothing was said about the brotherhood. Disguises were also said to play a part in this game. The trailer was not fully textured or rendered but seemed on par to the crow trailer originally showed for assassins creed 1. due to the lack of textures and the like combined with the fluidity i would assume it wasn't game play. furthermore after the trailer was shown, i was shown 3 pictures of the protagonist, all in different clothes and chose to pick a favourite. significantly underneath the word "ezio" was written on all 3 pictures. I believe this to be the guys name, as it sounds Italian. Again his face wasn't entirely shown, so i assume it is the future reliving the past again. Was told that this would be shown at a game expo this year, but not told which one. Hinted E3 when pressured. Release was given though on a broad scale. Late this year early next.